My 10 year old was chosen out of our family to review this program. The most common math concepts from K-5th grade are included and they are adding more weekly. With a family subscription, you can use it for up to 4 kids. I only have one in elementary school right now, but wow, this is great for those larger families with lots of little ones. 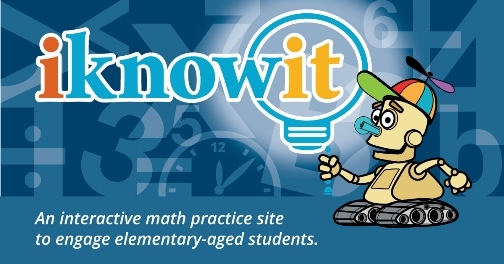 We have been working on multiplication and division in his regular math program, and he definitely needed the extra help, so we chose to work on these assignments with the I Know It program. In level C, which we are, there are all of these categories to work from. And within each of these categories there are even more choices! We used the program on our PC. It can be used with laptops and mobile devices as well. When I am logged into my teacher account, I can see all of the children I have as students. I can then assign them specific assignments if I want to. I can either assign them, or have them just work on what they would like. Because I am only working with one child on this, it was easier for me to just work on it with him, and assign the lessons as we went. I did look through the assignment steps for the teacher and they are very straight forward and easy to understand if you do choose to utilize it. One thing that I found very helpful for my son, was that there is an option that the problem can be read to him. He is a struggling reader, and the help was very nice. He performs well in Math, but when a lot of reading is required, he has a struggle with that portion of it. Each lesson has 15 problems to solve. It is very encouraging for getting them correct, with words of affirmation, and animation from the robot. On the flip side, there is a buzzer sound if it is incorrect. You can turn off the animations in the teacher settings if you wish. I think they were a fun addition to keep his attention. There is not any teaching with this. They are just problems to solve, that is one reason I would say it is a supplement to your regular math programs. It is an additional way to explore different math concepts that they have already been taught. This was a fun way to do math, and my son really enjoyed it. He never balked at having to do the extra math work, I think because I Know It made it fun!